Exploring the Roots of Evil – again! (5/5): What lies beyond labelling? After all this whinging about what Peterson has written it’s about time I tried to explain what it all looks like to me. I’m not sure yet whether all I have said undermines his basic argument. I am still struggling to articulate exactly how I would develop a model to bring it closer to what I experience as reality. In a way, I am grateful to him for having pushed me to think more deeply about this issue, even though I am uneasy about a basic aspect of his model. Anyhow this is how my thinking goes so far. And in case any of you need to know I’m handing over the writing of this to my right-brain, which, when I have the patience to listen to it on such matters, is almost always right. First things first. I firmly believe that labels, dichotomies and categories, when employed in the social or cultural field are almost always not only false, but potentially fatal. I am not saying this as a reward to my right-brain for having had the patience to let my left-brain bang on about everything it’s read on the subject for the last ten years. My left-brain believes it too, but can’t always act on it in the heat of the moment. It’s so much easier to slap a sticky label over the complexity of social experience: it makes deciding what to do so much quicker and easier. 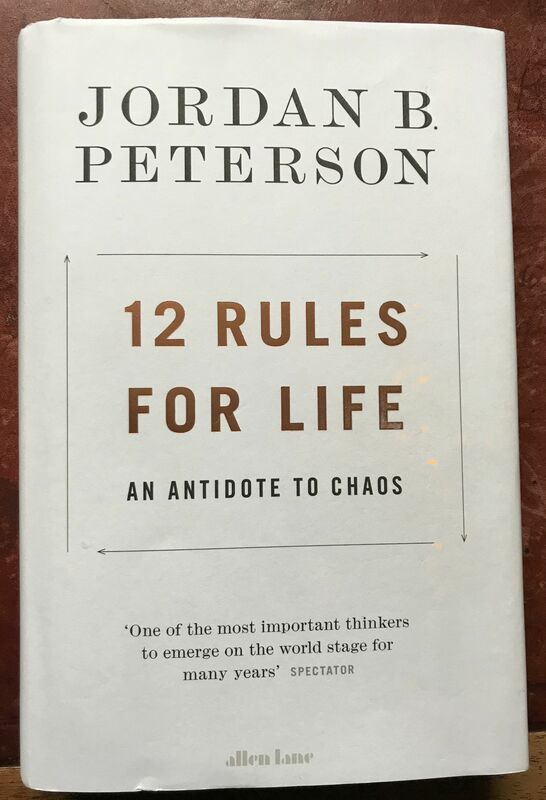 So, you can see why I’m so uncomfortable when I feel that Peterson, in spite of all the good things he says, seems to be happily dwelling in the land of opposites. If he was distancing himself from the categorising tendency he ascribes to our interpretation of the world, instead of seeming to be contentedly identifying with it, I’d be more inclined to agree with him. Yes, he sees its limitations, but seems to feel that it is an inescapable feature of our perception of the world, one which we have to be aware of, and adapt to, even if we need to soften its hard edges, if we are to function wisely in the world. He seems to have decided, perhaps not consciously, to live in the left-brain world of, to use McGilchrist’s words I quoted earlier, ‘language, logic and linearity.’ He doesn’t seem to entertain, at least in the first half of the book, the possibility that we could give more space in our perspective to the paradoxical and ambiguous take on the world of the right-hemisphere as McGilchrist describes it. This suggests to me that the part of his analysis, which contrasts chaos and order so definitively, is buying into the left-brain’s perceptual bias in favour of categories. The capacity of the rational mind to deceive, manipulate, scheme, trick, falsify, minimise, mislead, betray, prevaricate, deny, omit, rationalise, bias, exaggerate and obscure is so endless, so remarkable, centuries of prescientific thought, concentrating on clarifying the nature of moral endeavour, regarded it as positively demonic. This is not because of rationality itself, as a process. That process can produce clarity and progress. It is because rationality is subject to the single worst temptation – to raise what it knows now to the status of an absolute. The past can be redeemed, when reduced by precise language to its essence. The present can flow by without robbing the future if its realities are spoken out clearly. With careful thought and language, the singular, stellar destiny that justifies existence can be extracted from the multitude of murky and unpleasant futures that are far more likely to manifest themselves of their own accord. An ‘essence’ or ‘stellar destiny’ of any kind is more elusive than that. Peterson’s lack of coherence in the presentation of his ideas sometimes allows him to believe that he can have his cake and eat it too. Believing language can accurately capture the essence of experience is one of the things that can lead to our succumbing to the temptation of believing that what we know is the absolute truth. Again I need to acknowledge that an earlier discussion on genuine conversation (pages 253-56) illustrates how we can enhance our understanding by the use of words, rather in the same manner as I would argue can be done by consultation, in the Bahá’í sense of that word. In consequence, I even think that not just our social world, but developments in modern post-Newtonian science are forcing us to accept this as a fundamental characteristic of reality. Flux, unpredictability and ambiguity confront us the more deeply we seek to penetrate below the surface of our world. Machado captures this brilliantly when he says: ‘cambian la mar y el monte y el ojo que los mira’ (sea and mountain change, as does the eye that sees them’ – quoted in Xon de Ros The Poetry of Antonio Machado, page 5). If we refuse to let the way we see change, we will never see the world as it is, only as we think it should be. Seeing the world more as it is may be scary, but it’s not chaos, and it need not be dangerous. Molecular biology, confronted with the unruliness of life, is also forced to accept chaos. Just as physics discovered the indeterminate quantum world – a discovery that erased classical notions about the fixed reality of time and space – so biology is uncovering the unknowable mess at its core. Life is built on an edifice randomness. It seems we can’t escape it. What needs to change is our attitude to what our analytical mind, with its fixation on the maps it already has, finds disturbing. If we can trust our flexible right-brain intuitions more, what is new to us will feel less scary, and we will also tune in earlier to subtle shifts in the familiar, which are telegraphing imminent change, in a way that will help us deal with it more effectively. What I am striving for a lot of the time is to let my right-brain lead when I have to process complexity. After that, I need to integrate what it shows me into my left-brain maps without distorting or discounting anything essential. Much of our way of seeing, when we use the categorising tendency that Peterson both critiques and yet accepts as somehow inevitable, creates avoidable problems, even becomes toxic, lethal. More of that in a moment. I am not convinced that replacing categories with dimensions will in the end be a completely satisfactory way of interpreting the world. 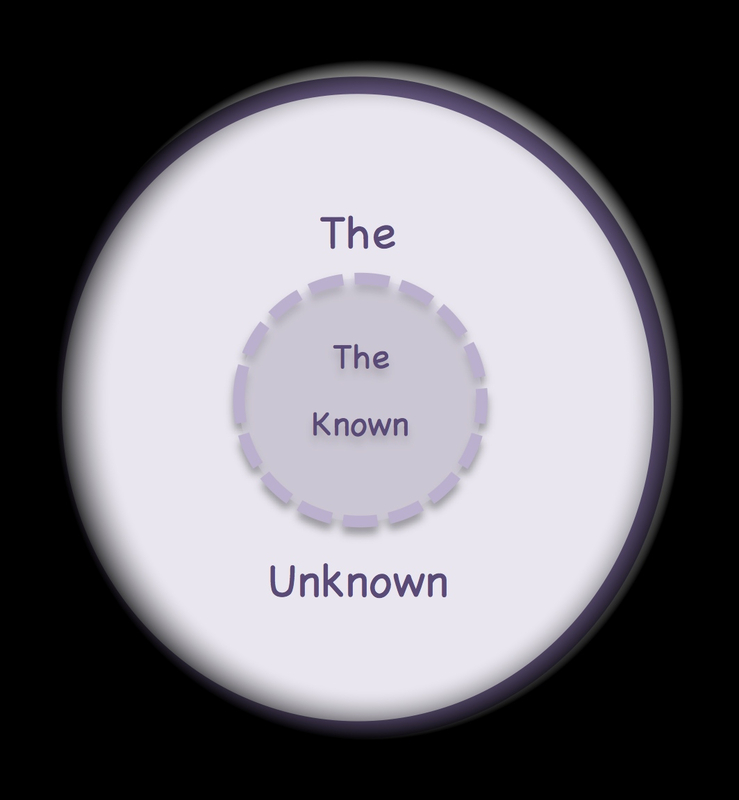 For a start it’s hard to use the difference between the known and the unknown as ends of a dimension anymore than to see it as indicating two categories. I have concluded, as I explained earlier, that knowing/unknowing are not identical, as Peterson seems to think, with chaos and order, which I am also saying may not be so easily distinguished either. This is because knowing and not knowing are characteristics of consciousness. The diagram on the left attempts to express that relationship. The dotted line around the edge of the known indicates my sense that the boundary, if there is one, is at best fluid. How do we deal with the forgotten – what was once known, is now not consciously remembered and yet almost certainly subliminally influences how we see the world and how we react to it? The dark area around the outer circle is meant to represent where physical consciousness of any kind ends – death if you like. Even this needs a dotted line, I think, given my belief that physical consciousness is not all there is. As I have explored that at length elsewhere, I’ve decided not to go there in this sequence which is already long enough, and I have to keep my left-brain quiet long enough to finish even this much. If we accept for now that thinking in terms of dimensions is legitimate, there are at least two categories of dimension active here, within the zones, if that is the right word, of knowing and unknowing. One concerns perceived reality, which stretches along a dimension relating to order and disorder between the extremes of order on the one hand, which can become tyranny, and on the other of chaos, which can be creative. 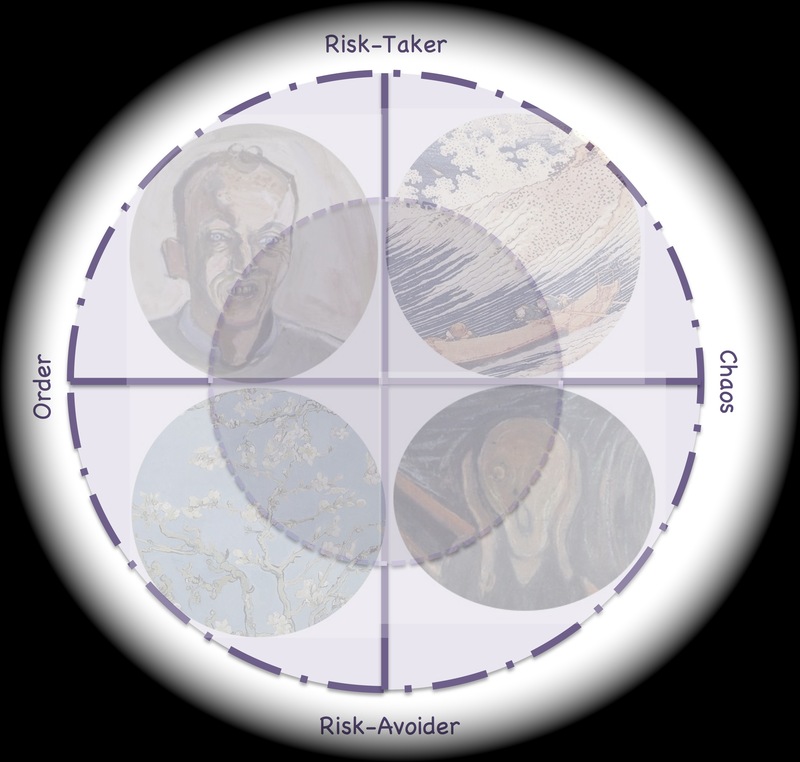 The other dimension concerns the preference pattern of the mind that interacts with those perceived possibilities: among many other possibilities, in addition to the holistic and analytical I’ve already touched on, there will be risk-takers and risk avoiders, as Peterson makes clear he is aware towards the end of his book. Please hold in mind my fundamental scepticism about the need to accept that we have to split reality up, either in terms of order/disorder or degrees of risk taking, whether as dimensions or categories. Let’s accept for now that they hold good up to a point. 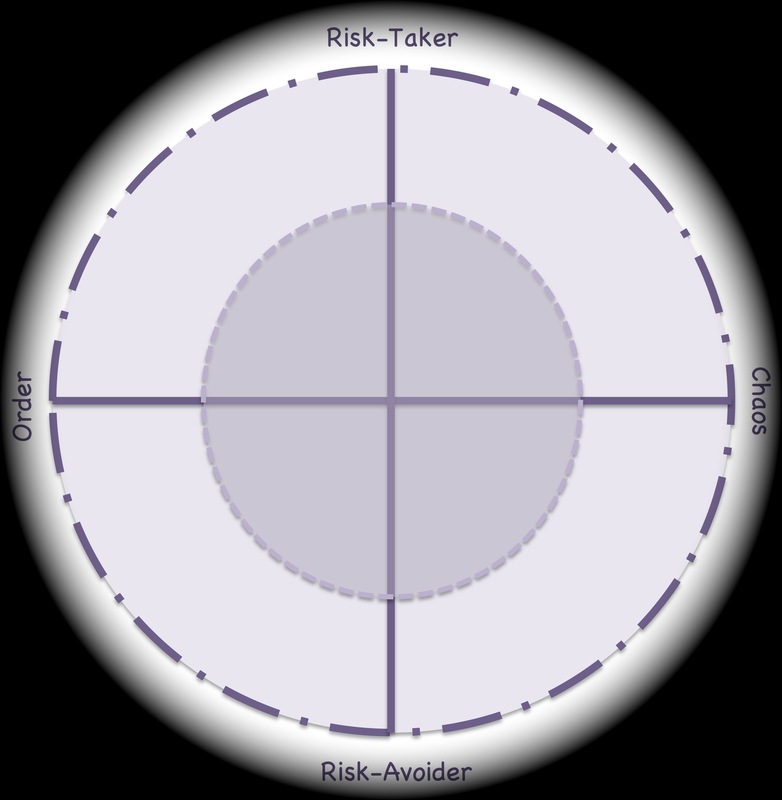 A risk-taker will delight in what they experience as the excitement of what the risk-avoider will see as the dangers of chaos, and conversely will feel stifled by the perceived order a risk-avoider thrives in. It is important to note that perception is indeed an unavoidable mediator of all these interactions between reality and consciousness. I don’t think Peterson attaches sufficient importance to the flexibility of perception, and even fails to consider the possibility of its using dimensions rather than discrete categories. Nowhere that I’ve read so far does he deal with the possibility that we could potentially transcend even dimensional thinking when it is necessary to do so, either because it ceases to be useful or becomes potentially dangerous. Left-brain perception is his default mode, just as much as it is that of our culture. The rich potential of right-brain perception, in spite of the value he clearly sets on myths (reduced though to his left-brain interpretations of his selection from them), doesn’t really feature. Why should we exert ourselves to go against our left-brain tendencies? They’ve lifted us out of the middle ages. Why can’t they lift us further? 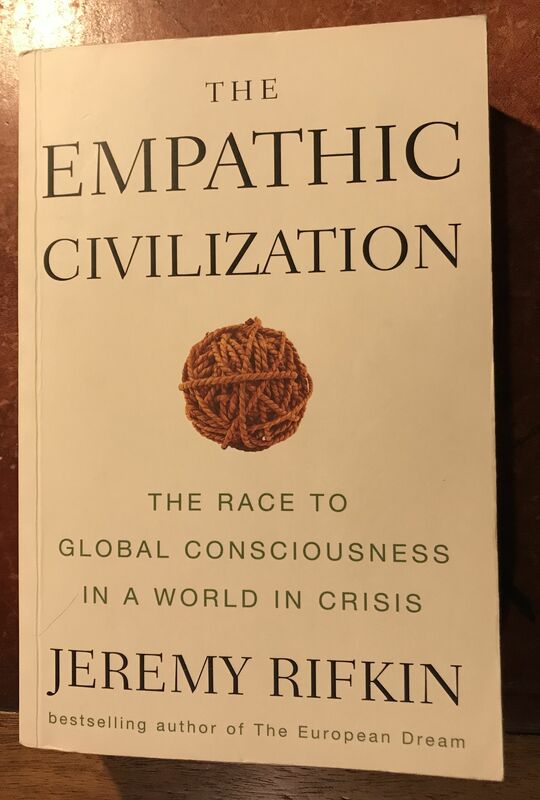 That’s a complex issue, parts of which I’ve addressed at length elsewhere on this blog in terms of altruism, compassion and civilisation building. In the light of the various references I quoted in the earlier two posts in the context of why human beings can perpetrate such evil, I’m going to focus briefly on why labelling, a left-brain temptation with emotional consequences, is so toxic. I have worked for more than thirty years in mental health. I have seen at close quarters the costs and benefits of diagnostic labels. Yes, getting the label of schizophrenia will open the door to the benefits system and give you access at least to some form of drug treatment. But drugs are a double-edged sword as I have discussed before. One edge can, if the patient is lucky, cut through the tormenting ropes woven around the mind by derogatory voices, but the other edge all too often clouds any clarity of thought and stupefies the mind. The diagnosis also carries, as so many labels do, a heavy weight of social stigma, which all too often more than outweighs any benefits. 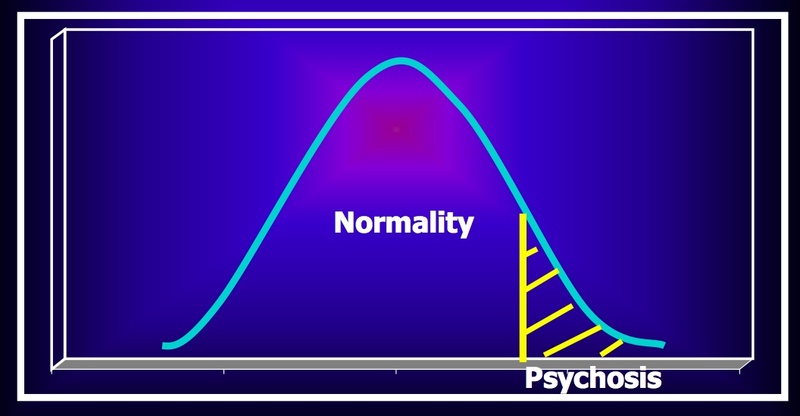 It’s far better, in my view, to look at the person as a whole, and tackle the more complex question of what these so-called psychotic experiences mean, and where their roots are in the felt life of the person. Other labels are often at least as bad if not worse: abnormal, disabled, backward, black, unclean, alien, outsider, mad, cockroach, sewer rat, immigrant – the list is potentially endless. If we see ourselves as in the normal, able, white, clean, insider, sane, human, legitimate citizen category, we can smugly comfort ourselves that we deserve all the good things we have whereas these people don’t and perhaps even couldn’t. It’s very cosy. It gives us no motivation to change anything. It even justifies to us in our own minds taking steps to protect what we are and what we have from ‘contamination’ or destruction, even if that means harming other people perceived as coming from any of those completely false categories. It wouldn’t take long, given the right circumstances, to tipple over into enthusiastic eugenics or even forms of genocide. We can see these toxic options unfolding around us even now. 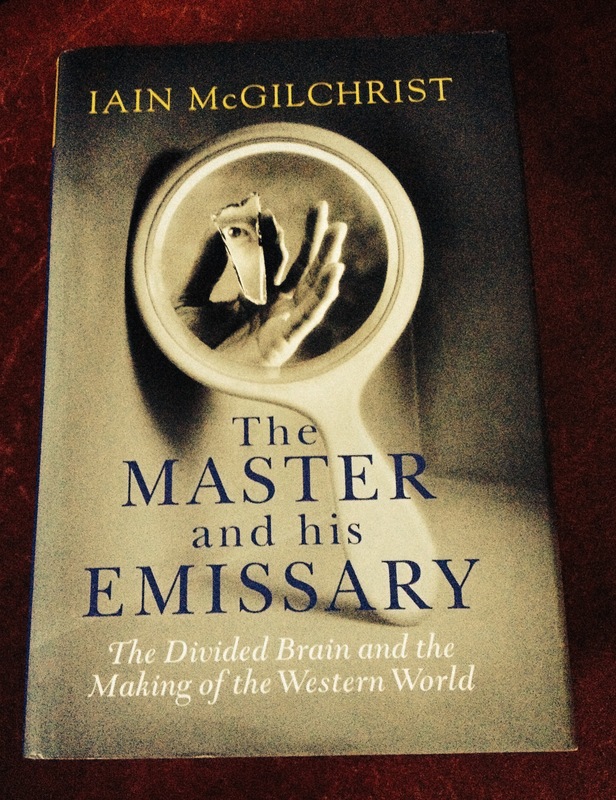 Using only our left-brain analytic mind it is hard for us to experience the world except in such categorising ways. Yet, experiencing the world holistically is exactly what we have to do, especially in terms of our perceptions of our fellow human beings, and also the life-world around us. Labels won’t work if we’re going to survive. We are interconnected. In fact we are in essence one family, even one huge multi-minded entity. Only by operationalising this insight can we transcend this problem. And I think, from the evidence I’ve quoted earlier in this sequence, it’s not just Bahá’ís that see it this way. The rejection of deeply ingrained prejudices and a growing sense of world citizenship are among the signs of [a] heightened awareness. Yet, however promising the rise in collective consciousness may be, it should be seen as only the first step of a process that will take decades—nay, centuries—to unfold. For the principle of the oneness of humankind, as proclaimed by Bahá’u’lláh, asks not merely for cooperation among people and nations. It calls for a complete reconceptualization of the relationships that sustain society. 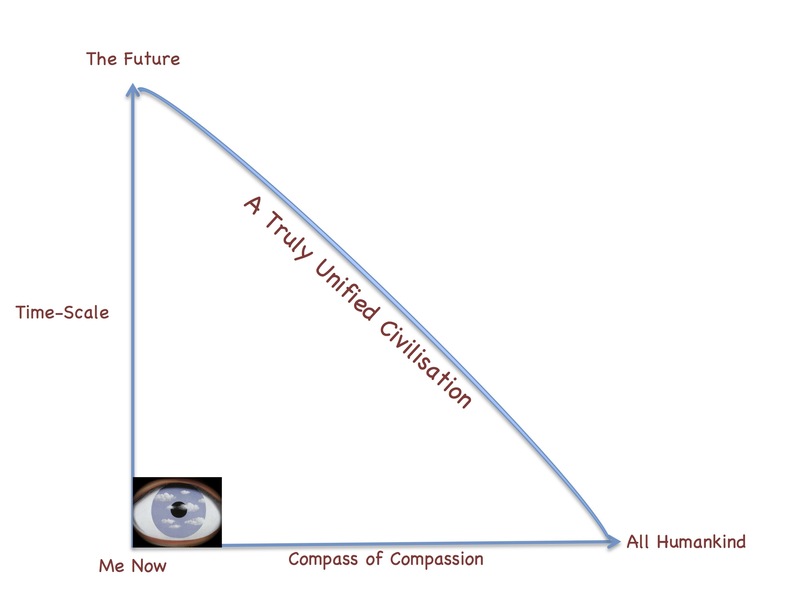 The diagram at the bottom of this post seeks to represent the magnitude of the task we face, moving as we must from the self-centred and short-term processing our bodies are programmed for, to the transcendent vision of our ultimate goal, far in the future though it may be, of a united humanity working together in harmony. We acknowledge that religion has been and sometimes still is an obstacle in the path. 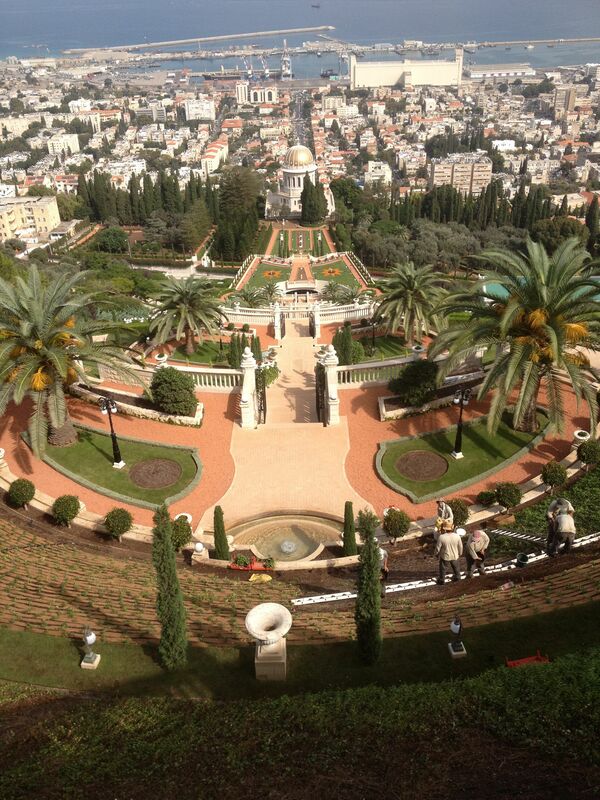 ‘Abdu’l-Bahá, anticipating by at least six decades Robert Wright’s caveat quoted in the first post, made it quite clear that ‘religion must be conducive to love and unity among mankind; for if it be the cause of enmity and strife, the absence of religion is preferable.’ (Promulgation of Universal Peace – page 128). No two men can be found who may be said to be outwardly and inwardly united. The evidences of discord and malice are apparent everywhere, though all were made for harmony and union. The Great Being saith: O well-beloved ones! The tabernacle of unity hath been raised; regard ye not one another as strangers. Ye are the fruits of one tree, and the leaves of one branch. For others, such as Rifkin, it is awareness of the supreme importance of preserving our planetary homeland. Whatever the source of our inspiration, it has to bring the warring selves within us into harmony before we can create a truly peaceful world. Whatever the value is that we find, it has to be a very powerfully motivating one, but essentially benign nonetheless. It must not replicate the self-righteous crusading we can still see around us, which believes that if you are not for us we can kill you. A commonly used phrase captures an important aspect of this vision: unity in diversity. It allows for perceived differences within an essential unity, but does not fossilise them or make them an excuse for discrimination. I am fairly sure that Peterson would not disagree, at least, with this sense of our common humanity, and the imperative need confronting us to recognise and act upon it. Because he comes from a Christian perspective, I’m sure he would recognise the importance of God as well. I hope I have not been attacking a straw man in all this. Even if I have, I hope I managed to avoid placing him in a separate category of human being from my more enlightened self. In many ways he seems to have thought more deeply than I have about whole aspects of this problem, and I owe him a debt of gratitude for forcing me to think more deeply about my own model of the world.
. . . since Jordan Peterson does indeed have a good claim to being the most influential intellectual in the Western world, we need to think seriously about what has gone wrong. What have we done to end up with this man? His success is our failure, and while it’s easy to scoff at him, it’s more important to inquire into how we got to this point. He is a symptom. He shows a culture bereft of ideas, a politics without inspiration or principle. Jordan Peterson may not be the intellectual we want. But he is probably the intellectual we deserve. My right-brain smiles quietly, thinks ‘Fat chance!’ but says nothing.